We think that 2017 is going to be a wonderful year for Arsenia Blu. We've decided to drop the Blu from the name of our skincare. As we slowly sell out of the remaining products currently available in our stock, you'll begin so see subtle changes in the look of our labels and our web store. 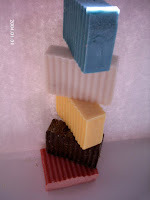 The first few months you will see the basic Cause ribbon shape on all of our soap bars. However, at Arsenia Blu, we don't want to blend in. WE STAND OUT! Look for our Exclusive Ribbon Desgin to appear on our bars and exclusively in our web store in the Summer of 2017. The Look of Arsenia's Purposeful Giving Soap Bars will have our original Ribbon logo design that was created for the owner of Arsenia Blu Beauty over 7 years ago. Never having been used before in her business endeavors, she has decided that the Purposeful Giving Charity Cause is the most perfect place to use this beautiful logo. We go on record as having commissioned, ordered and purchased this exclusive design, and we can prove this statement as true. No permission will be given to any individual, company or website in the use of this Ribbon logo design. It is the exclusive property of Cleo Anderson LLC. and Arsenia Blu Beauty. Any product, packaging or website displaying this logo design is in direct violation of our rights and is unlawful. We will seek restitution for this violation. At the bottom of each page you'll see a donate button. Where you can make a personal donation to Arsenia Blu to help us reach our goals. Please consider becoming a sponsor for Arsenia Blu.